I am very excited to share the launch of my new online art gallery with you!! I have been slowly working on this most of the year and she is finally live! Please click HERE to visit. Part of the inspiration for Phoenix Rising comes from a serious health issue Lara discusses for the first time publicly in this interview. Read it HERE. Listen to Lara's podcast with Cyrus Webb about overcoming fear and offering your gifts to the world HERE. 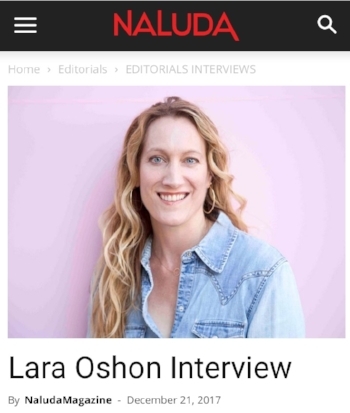 Lara Oshon chats with The Daily Shuffle about songwriting, strength of heart, and memorable moments creating the Phoenix Rising video with Nathan Prevost! Read it HERE! Conversation with Soundigest about the happy surprise singing was for Lara after being a social worker, and how creativity is a form of service. Check it out HERE! Occhi Magazine had a fun conversation with Lara about what inspired Phoenix Rising, her writing process, her Grandmom, & the Rise Up t-shirt campaign! Read more HERE.